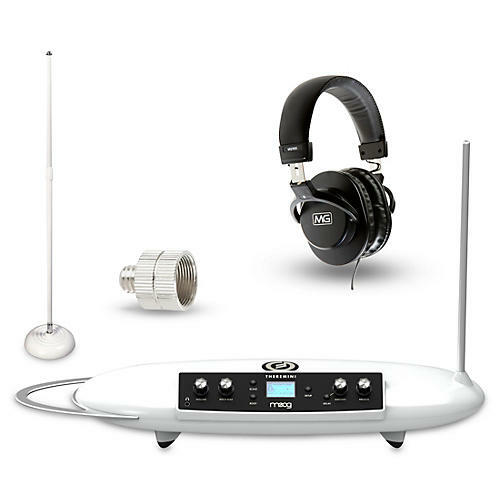 This package includes the Moog Theramini, an adjustable matching stand and a pair of Musician's Gear MG900 Studio Headphones. The Theremini is a re-imagination of one of the oldest electronic musical instrument in history and Bob Moog's first love - the Theremin. Its design fuses the experience of performing with an instrument you don't actually touch, with a powerful sound engine derived from Moog's award-winning synthesizer, Animoog. The Theremini guarantees immediate success to any player at any skill level, while providing new ways to experiment with music, education, and gestural control.